It’s hand carved and tooled leather. Has a few good coats of acrylic sealant so it should look good for a long time. I don't think it came in smaller. That's an awesome coaster. I was actually gonna reach out to u on instagram. In regards to a trade, when I got up to Maine. I actually have an extra copy of 'Andean sling braids' book. If u were interested. Brand new, mix up on a recent Amazon order I had made. It's actually has a 2016. Copyright. By Roderick Owen, and Terry Flynn. I will send u a pic through instagram. Also cropped a bit so you don't lose any details. file is around 20x smaller than original. nice work....did u use a stitch awl? ...i like the image, is it stamped? 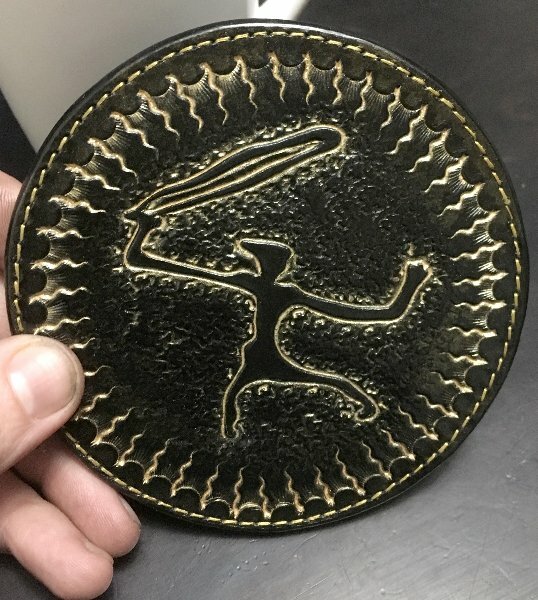 i've been looking for something to put on the front of the slinging ammo bag i am making, so far the turkey foot track is leading the options, but that is pretty neat design u have going there. Thanks CA! I uploaded from my phone a couple different ways hoping it might turn out. RS- it’s hand carved and tooled right into the leather. As for the sewing, I have a sewing machine for my leatherwork and try and avoid hand sewing whenever possible hahaha! The image is from catal huyuk and is the earliest cave painting of a slinger. lets you easily crop and resize. Catal hyuk image is somewhere between 7-9000 years old. They might have narrowed it down a little more by now. u still got it? what do u want for it? a pound of some fine homemade blackpowder? (not sure of the shipping laws on that where u live)...a dead chicken? a pic of me? what do u want for it? lmao - shipping laws for a lb of black powder, in the current climate: don't. You hand grind ? tumble ? or another method. I’m not into guns so the black powered isn’t my cup of tea. ah so the dead chicken was not a temptation for you, eh....well that is only because u do not know what it entails. but none the less, we will remove that offer as i do not know how to ship it anyway. but a dead chicken is what we refer to as wild turkey. it involves, killing, filleting the breast, removing another part, smearing breast in proper juices of other part and searing the meat in less than twenty minutes after death...then slow cooking. after that it is good for a while. it is magic food. i have tried both and now only hand grind. i make my own charcoal out of apple(2nd best, imo), because plum wood is hard for me to find. i use the jar method. a mixed ration by volume of 100/18/16. (VOLUME NOT WEIGHT) or 100/24/0 to 100/32/0(depending on what it is for)..also 100/20/14.5 (again all these by volume not weight)... placing green meal into a mason jar, with alcohol and h2o(50/50 alcohol/h2o mix)...at between a ten to twenty parts meal to one part liquid ration; ...exactness is not too important just do not over saturate it....seal it with a lid, let it sit up side down for four day then turn it right side up for four more days... compress any liquid(if any at all it should not be much) out of it that can be removed, granulate with screen mesh, let sit for a day or two but then straight into paper bags for a week,(there is a process to that too, which i will skip for now) then let air dry for a week or two.....after that it eventually tops out but it seems like the longer it sits, the better it gets. Back in the old days, used to mix with acetone and grind till it was a dry powder.